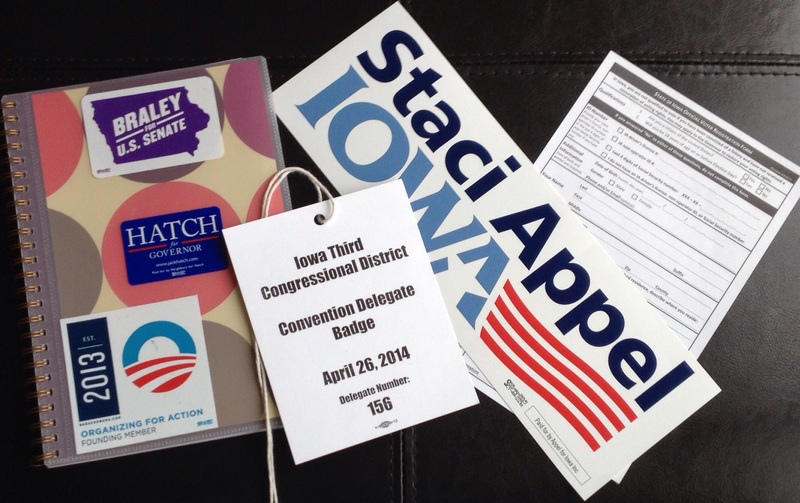 Saturday, April 26th, I went to my first Iowa 3rd Congressional District Democratic Party Convention. I was a delegate at the convention and I was on the platform committee. It was an awesome experience and I was able to add my voice to what the Iowa Democratic Party stands for. That in itself was affirming and uplifting. My voice was heard and respected. It is a powerful thing to be welcomed and accepted by your community and the Iowa Democratic Party is inclusive and welcoming. This is very much in contrast to the Iowa Republican Party. They are exclusive and elitist which is not what democracy is all about. It is not what the United States was founded on. The Republican Party is all about speaking for and working for the interests of the corporations and the wealthiest Americans not the nation as a whole. They are about cuts to the programs that help the middle-class and poor. They especially want to cut social security, medicare, and food stamps. They also want to further cut funding to live-saving research like stem cell research. They believe in amending our nation’s constitution to ban equal rights for LGBTQIA people. They want to take women’s reproductive rights away and instead give those rights and choices to politicians. The Iowa Democratic Party is the complete opposite of the Iowa Republican Party. We are inclusive and welcoming. We believe in giving everyone an equal voice. We believe in equal rights for all. We believe in ensuring that money is not speech and that corporations are not people. We believe in sustaining social security and medicare. We believe in increasing the ability of Americans to find jobs so that they do not have to rely on food stamps to feed themselves and their families. We believe that women’s reproductive health is between her and her doctor not politicians in Washington. This is why I cannot in good conscious allow my friends or family vote Republican in 2014. I vow to fight for progressive values. This is why I decided to volunteer to be a delegate for the convention and get more involved in the Democratic Party. The election in 2014 is all about giving America a chance to move forward. We have a choice. Do we want to continue on the path where our nation continues to do nothing and go from brink of shutdown to the brink of shutdown because the Republican controlled U.S. House refuses to work? Do we want to continue to let radical tea party Republicans block common sense immigration reform, increasing the minimum wage, and universal background checks? If yes, then vote for the Regressive Party (Republican). If no, stand with me and vote Democrat. If we do not take back the U.S. House and keep the U.S. Senate our nation will head down a dangerous path were the wealthiest Americans will continue to get richer and the corporations will continue to buy America. Vote Democrat in 2014 for the good of the nation. If you are in Iowa, vote for our Democratic candidates: Go here to see them! Next Full Equality Pledge – Equality Now!